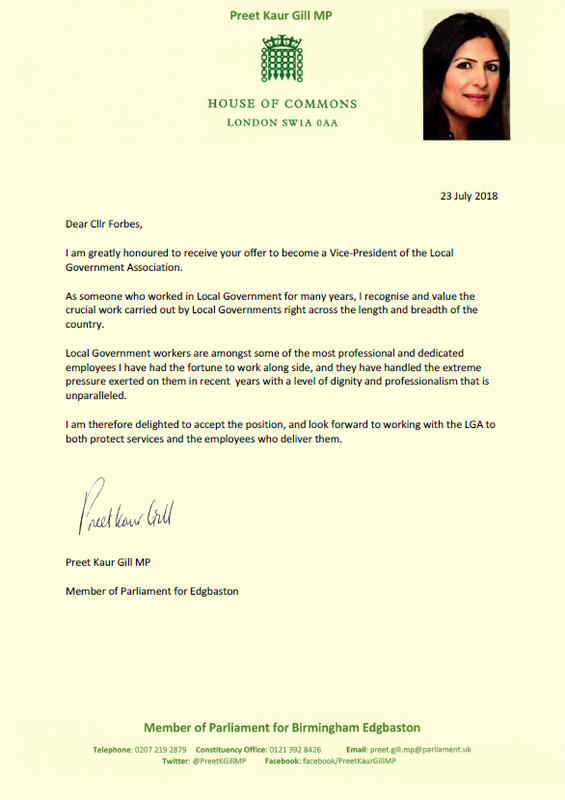 Last month, the Local Government Association's (LGA) Labour Group leader, Councillor Nick Forbes, invited Preet Kaur Gill MP to become a Vice-President of the LGA. In Preet's acceptance letter, she said, "I am greatly honoured to receive your offer to become a Vice-President of the Local Government Association. As someone who worked in Local Government for many years, I recognise and value the crucial work carried out by Local Governments right across the length and breadth of the country. Local Government workers are amongst some of the most professional and dedicated employees I have had the fortune to work along side, and they have handled the extreme pressure exerted on them in recent years with a level of dignity and professionalism that is unparalleled. I am therefore delighted to accept the position, and look forward to working with the LGA to both protect services and the employees who deliver them."